“Frog: A Modern Fairy Tale” is a delightful summer entertainment for the whole family, sure to please both children and adults. Written and directed by Christopher Compton and Holly Erin McCarthy of Theater Under the Stairs, the show’s message is simple: don’t ever lose your childhood sense of imagination, but the delivery is wonderfully complex and meandering. The show is presented on the main stage at Cotuit Center for the Arts through August 31 by Theater Under the Stairs (which presented “Alice’s Adventures in Wonderland” there last summer). Performances are Mondays, Tuesdays, and Fridays at 10 AM and Friday also at 12:30 PM. The cast of 14 children (sixth grade and up) and adults, many playing multiple parts, is terrific. They are all accomplished actors and it is clearly evident how much fun they are having with this witty and cleverly written play, which incorporates retellings of familiar fairy tales, comic songs (original lyrics to well-known tunes), and, of course, magic. Five charming young women, led by the talented and funny Hannah Carrita, play the fairy-like Figments, who tell us to turn off our cellphones, introduce the show and change the scenes, speaking only through kazoos. Playing the Figments (and roles in other stories) are Maret Gable, Leslie McKinnon, Kylie Laue, and Shannon Lindlau. They bring a smile every time they appear. Shaela Alves, a Mashpee sixth grader, plays Kitty, a young girl with quite an imagination of her own. Her game of dolls involves a mother who is a toaster and father who is a tree. 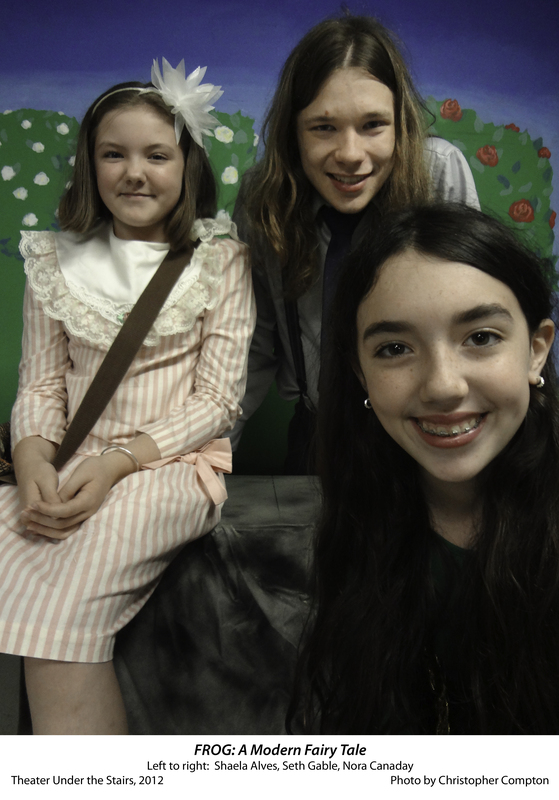 Her best friend is a frog named Lily (Nora Canaday, a Barnstable seventh grader) who lives in the swamp. The problem is that Kitty’s parents (Anthony Teixeira and Holly Erin McCarthy) forbid her from going to the swamp, fearful of the consequences. Teixeira and McCarthy are perfect in these roles—loud, self-righteous, and cartoonish, great fun to watch and laugh at. “No child of mine is going to be getting all warty,” Mr. Quito yells, fearful that a wart-covered Kitty will never find a husband. Boggs (Seth Gable), the Quitos’ butler, crosses the stage in rubbery leaps and bounds, listening to the orders of one parent, then the other. He is sympathetic to Kitty’s wish to play with Lily, but tells her to stay away from the swamp, giving her a magic ball to play with. Gable is just right in this role as an adult who still believes in magic. Alves is sweet and earnest in the role Kitty, but she heads straight for the swamp, where Lily awaits. 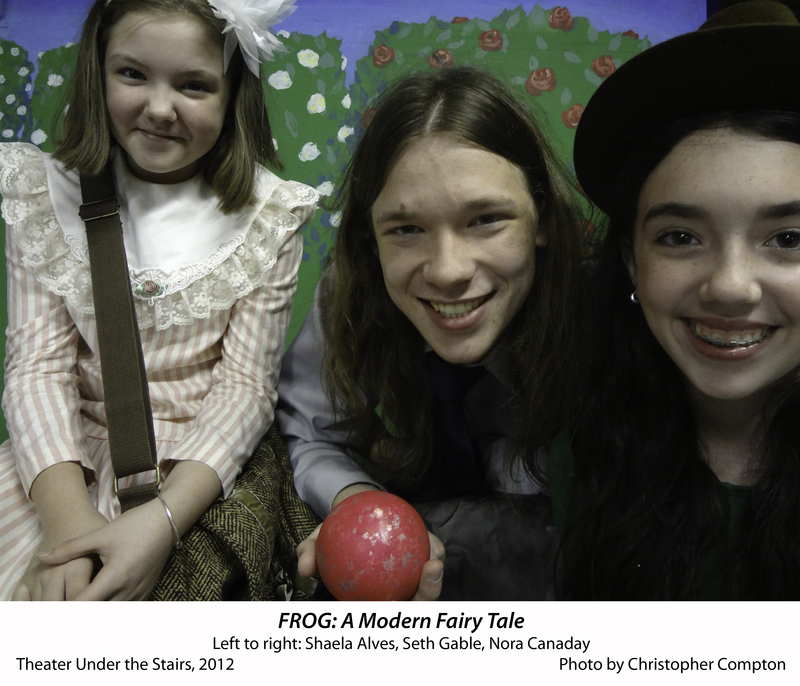 Lily is a clever and kindly frog, a comedian who loves to tell stories, and Canaday shines in this role. An articulate speaker and graceful hopper, she tells her stories with enthusiasm, stands up for her rights with dignity, and makes a courageous—and very funny—attempt to transform herself for the sake of friendship . As Lily begins her stories, other characters come out to act them out. In her rendition of “The Three Little Pigs,” Amelia Dintino, Celia Krefter Wills, and Austin Baacke play the piggies, Salvatore, Euclid, and Marvin, respectively. Hannah Carrita and Devin Low play two different versions of the Big Bad Wolf. There are several other stories, including one told by Boggs, and much humorous interaction between Kitty’s parents and Kitty and her friend Lily. Compton and McCarthy have done numerous shows together, and this is one of their funniest. Children may not get every joke—some are clearly for adults—or even follow the whole convoluted plot, but young children (and others) will enjoy the antics of the characters, the costumes, the songs, the kazoos, and the magic of it all. Costume design is by McCarthy; choreography by Carrita, scenic design by Michelle Law, and stage management by Rose Webster, a sophomore at Sturgis. Tickets are $10 and may be purchased by calling the box office at 508-428-0669 or visiting artsonthecape.org. Cotuit Center for the Arts is at 4404 Route 28 in Cotuit.